FairMail - Blog - Who is behind FairMail now? After the announcement of the takeover, FairMail founders Janneke Smeulders and Peter den Hond have been overwhelmed with messages of support and they are very glad about it. 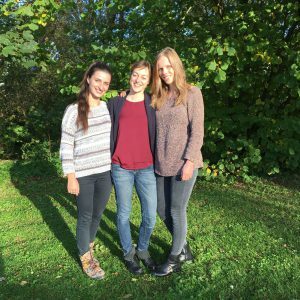 We guess many of you are probably wondering: “who is running FairMail now?” Well, everyone please meet Kira, Federica and Natalia. Kira, Federica and Natalia met for the first time in 2015 when the three of them were volunteering for FairMail. Among all the volunteering opportunities that they could have picked, they were all driven to FairMail, somehow it looks like it was meant to be. During their time in Huanchaco, they got really enthusiastic about the project, they bonded with the teenagers and fell in love with Huanchaco, the small fisher village that hosts FairMail’s Peruvian headquarters. After their experiences as volunteers, they felt their time in FairMail was, somehow, not over. Back to their countries, they kept in touch with FairMail, they engaged in different activities and became, eventually, sale agents. Receiving the email with the proposal of succeeding Peter and Janneke in the management of FairMail came as a total surprise, to say the least. They took their time to let the news sink in and eventually they overcame the fear of the unknown and decided to embrace the change. Let’s get to know them better right now. Kira works as a project manager responsible for Web-Marketing and IT-Development in a mid-size company close to Stuttgart, Germany. Thanks to her family’s love for travel and adventure, she developed a global mindset and she is convinced that her vision of a better and sustainable future will be achieved by sharing knowledge, creativity and the principle of capacity building. Federica is a freelance English and Italian teacher and translator based in Turin, Italy. She is a word nerd at heart, communication is her main area of expertise. She believes the world can be made a better place by creating and fostering dialogue among people of all faiths and backgrounds. She acknowledges that traveling is fatal to prejudice, therefore she never stops exploring. Natalia studied International Social Work in Ludwigsburg. She is a passionate globetrotter and admires to capture her traveling experiences with photographs. Beyond Germany and Poland, her homecountry, she feels at home in Kenya, Indonesia and in Peru where she volunteered as part of her studies. Natalia has the interests of the environment at heart and she believes that international exchange and the sharing of knowledge can make the world a better place. They couldn’t be happier to start this adventure together and they look forward to everything that this journey will have to offer.